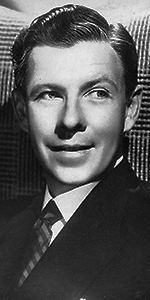 George Muphy was a popular star of 1930s and 40s musicals. Hanging it up in 1952, he was honored for his contributions to the World War II efforts, as he began to rise in the Republican Party in California, eventually becoming a U.S. Senator. Born to Irish Catholic parents, Murphy's father was track coach for the University of Pennsylvania, and coached the gold-winning U.S. tack team at the Olympics in Stockholm, Sweden, in 1912. George attended Trinity-Pawling School in Pawling, New York, then the Peddie School in Hightstown, New Jersey, followed by his enrollment at Yale University, in New Haven. Dropping out in his junior year, Murphy knocked around a bit, working as a tool maker for the Ford Motor Company, then as coal miner, and as a real estate agent. In the early 1920s, Murphy moved to New York City, getting a "day job" at a brokerage firm on Wall Street. The real attraction was the stage, however. Teaming up with dancer Julie Johnson, Murphy and Johnson performed all over the New York area — weddings, coming out parties, nightclubs and so on. The two would marry in 1926. Murphy made his Broadway debut in Shoot the Works with Heywood Broun in 1931, where he sang a ditty entitled, "I Want to Chisel in on Your Heart." He struck paydirt playing Sam Jenkins in his second show, Of Thee I Sing, by Kaufman and Ryskind, with music by the Gershwins. It ran for almost 500 perfs, from December, 1931 to October, 1933. He then appeared in another musical hit on Broadway, Roberta, with Bob Hope for 295 perfs from November, 1933 to July, 1934 (his parts seems to have been written out of the film version). So Murphy got a pretty good role for his film debut in Eddie Cantor's Kid Millions (which played the Chinese in January, 1935). Work dribbled in, but by 1937, Murphy was a busy guy indeed: Broadway Melody of 1938 (played the Chinese in August, 1937), Little Miss Broadway (played the Chinese in July, 1938) with Shirley Temple, Broadway Melody of 1940 (played in February, 1940), Little Nellie Kelly (played in November, 1940), Ringside Maisie (played in July, 1941), and For Me and My Gal (played in November, 1942). Murphy appeared in the war film Bataan (which played the Chinese in June, 1943), then returned to musicals such as This Is the Army (released in August, 1943), Broadway Rhythm (released in April, 1944), and Step Lively (released in July, 1944). Murphy had considerablle executive powers, becoming president of the Hollywood Coordinating Committee, which organized the entertainment of troops by showbiz folk during World War II, was on the entertainment committees for the presidential inaugurations in 1953, 1957 and 1961. He was the president of the Screen Actors Guild from 1944 to 1946, and was a vice-president at Desilu Productions from 1958 to 1961, and at Technicolor Corporation, from 1961 to 1964. Murphy had another role in the war film Battleground (released in January, 1949), but good film roles were becoming more and more difficult to find in the changing Hollywood of the early 1950s. In 1951, Murphy was given an Honorary Oscar by AMPAS, while his last film was Walk East on Beacon! (released in June, 1952). In 1953, Murphy began his leadership role in the California Republican Party, having been elected to the patry's chairmanship. He directed an episode of MGM Parade, which aired on ABC in November, 1955. In 1964, he was elected to the Senate by the voters of California, paving the way for Ronald Reagan to enter politics as well. Before losing his Sentate seat to John Tunney in 1971, Murphy, who possessed a sweet tooth, established the Senatorial "candy desk," which is a desk on the Senate floor filled with candy for all Senators to enjoy. The Democrats soon initiated their own candy desk. Murphy became the chairman of the Senate Republicans in 1967. Shortly thereafter, he developed throat cancer, resulting in the removal of his larynx. For the rest of his life, Murphy could only speak just above a whisper. He published his autobiography, Say . . . Didn't You Used to Be George Muphy? in 1970. He died of lukemia in Palm Beach, Florida in 1982, at the age of 89. Grauman's Chinese Theatre, Hollywood, California. 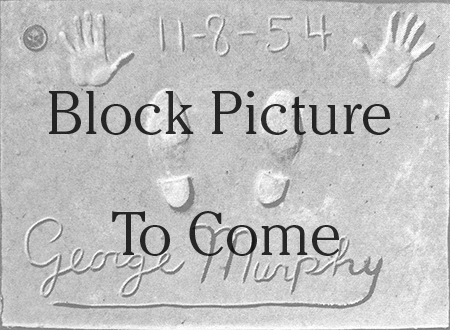 George Murphy Forecourt ceremony, Monday, November, 1954. 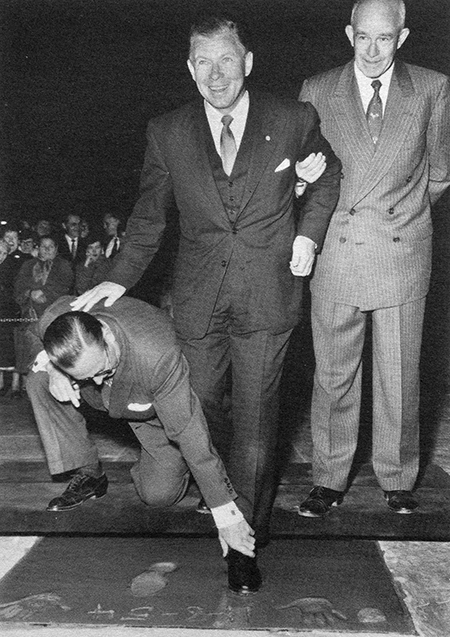 Fox West Coast Theatres executive Edwin F. Zabel adjusts George Murphy's while being held stady by the National Chairman of the United Defense Fund, retired General Omar Bradley.